Japanese Type 89 Medium Tanks serial production began in 1931. It entered service in Japanese Imperial Army one year later, in 1932, and soon became the main tank of it. It required a crew of 4. Its armament consisted of Type 90 57mm gun and 2 Type 91 6,5mm machine guns. 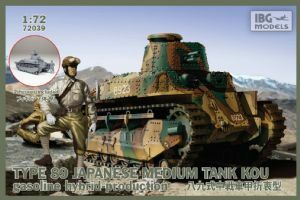 Final production version of Type 89 tank - „OTSU" was the first mass produced tank with a diesel engine in the world. Type 89 tanks of different versions saw action in the Second Sino-Japanese War, in the Khalkhin Gol battle against Soviet Union and in Second World War. It proved to be a very effective against Chinese forces but was already obsolete by the time of Khalkhin Gol and battles against Allies in the Pacific theater of WWII.